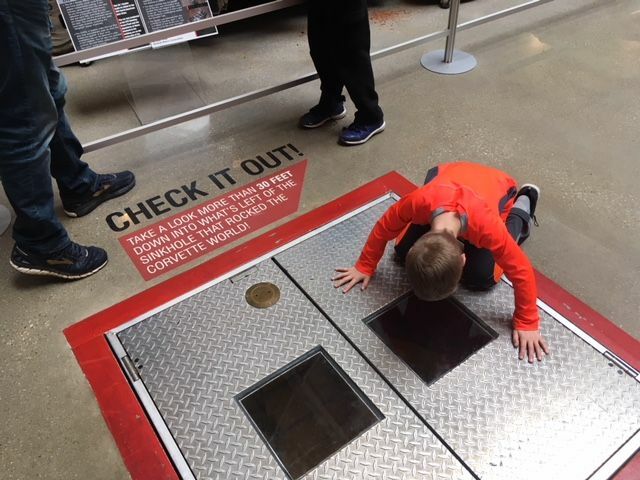 We recently took a road trip down to the Corvette Museum to celebrate my son’s birthday. The Corvette Museum is located in Bowling Green, KY, an easy hour and a half drive from Louisville. 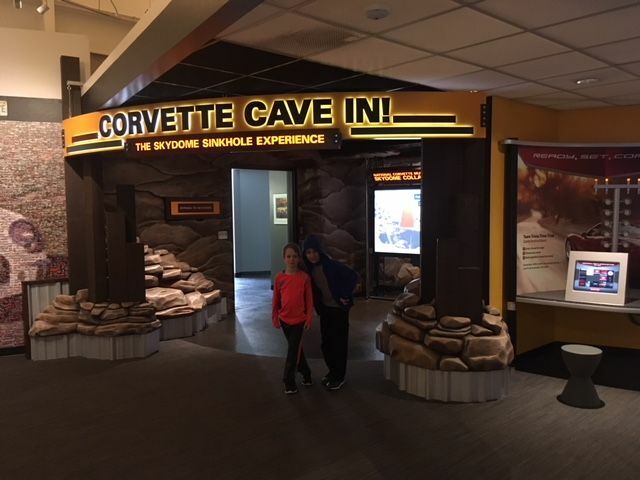 We arrived around 10:30am (they are on Central Time Zone) and we were happy to find out that the Corvette Rides had no wait (this is an extra cost on top of the museum price and a waiver needs to be signed). There were 3 cars to choose from and one child picked the 1966 Rally Red Convertible 327 and the other chose the 1979 Corvette Red Coupe. They loved the ride and the drivers did a good job explaining some about the cars and giving them safety tips. The trip lasted about 15 minutes and both boys said they had a great time and got to go fast around the track! By this time we were all hungry so we stopped in at the Corvette Café and had lunch. They had a small menu but just enough choices to make us all happy. A kid’s menu was available as well as burgers, salads, hot dogs, and BLTs. They also had malts, shakes, and cookies but we did not indulge on this trip. Once we finished up our meals we headed out to the museum and passed cars that were custom ordered that lined the walkways inside the building. As we were walking one of the owners came to pick up his car and got to drive out of the building to a round of applause from all the museum goers. Once we made it to the museum we were delighted to take a trip down memory lane with Corvette’s from the 1950s or so to the present, all surrounded by history of their time. We also found a Kid Zone that had fun car activities to explore. 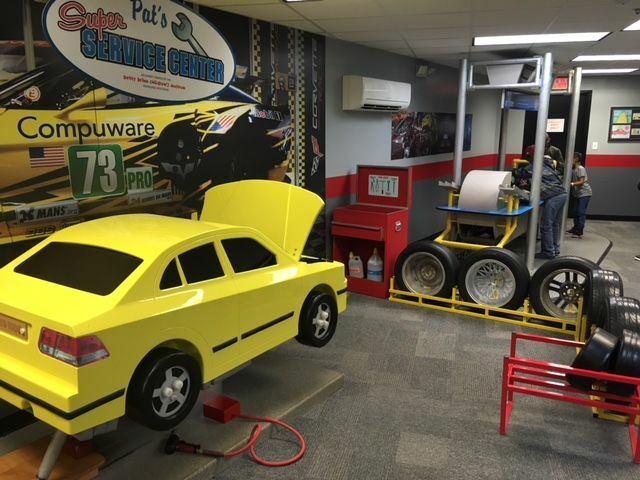 This included a toy car that was in need of maintenance and all the tools needed to fix it. All the cars on display had fast facts nearby with loads of information. The Corvette Cave-In: The Skydome Sinkhole Experience was also a neat exhibit that explores what happened the day of the sink-in, the recovery, how it was fixed, and the cars that were salvaged and those that were not. You can even look down a 48” manhole into the cave under the Skydome. We had a great time and spent about 2 hours exploring. 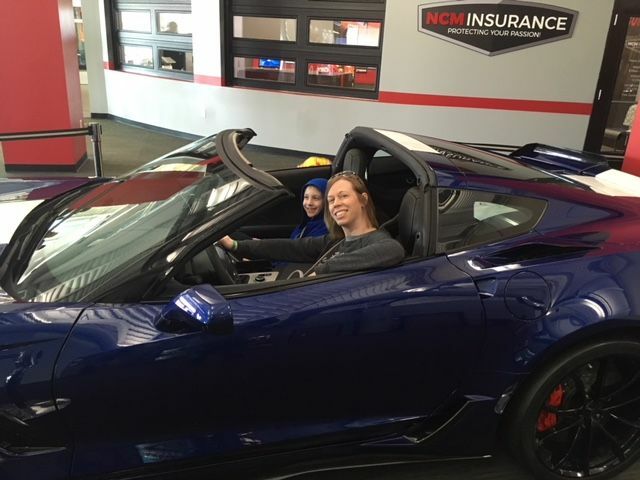 The Corvette Museum also offers a Corvette Simulator, Go-Karts, Corvette Touring (4 laps with a pace car) and more! Some of these are only offered at certain times so make sure to check the website for more information. 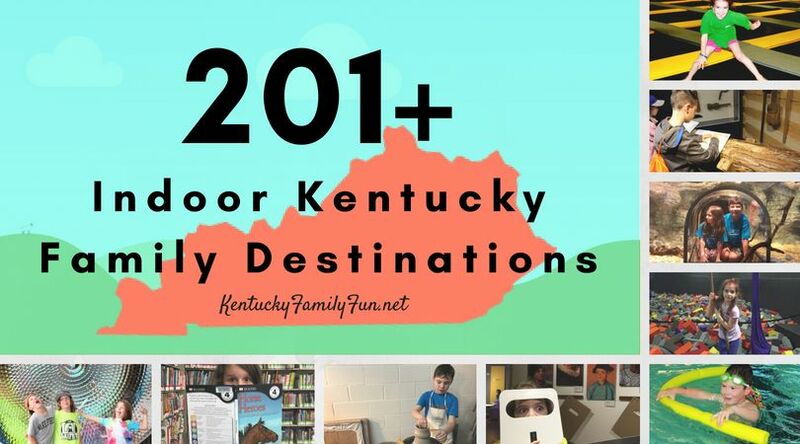 The Corvette Museum is located at 350 Corvette Drive, Bowling Green, KY 42101.